Linda Greenwood is the winner of the ECGRR Doggie Basket we featured during our Meet and Greet at the Responsible Dog Owner event in Panama City. 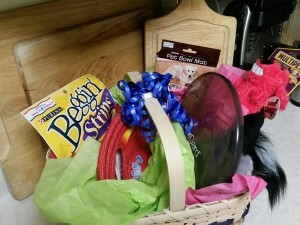 Filled with fun toys and treats, that furry member of her family is sure to enjoy it. So how did she win? By signing up for the ECGRR Newsletter when she visited our table. Be sure to check out our table/booth at upcoming area events for your chance to win something similar. Already subscribed to our newsletter? No problem – you can still sign up to win at the next event.